Feeling festive this year, we decided to get involved in a letterpress Christmas card exchange, set up as a little bit of fun by small group of printers on Twitter. Of course in reality, designing and printing your own Christmas card is rarely as simple as it sounds. Hand typset in 24pt Caslon and 8pt Monotype Grotesque 216, and printed in silver and Rudolf red on snow white Zerkell paper, finished off with a crisp blind deboss. 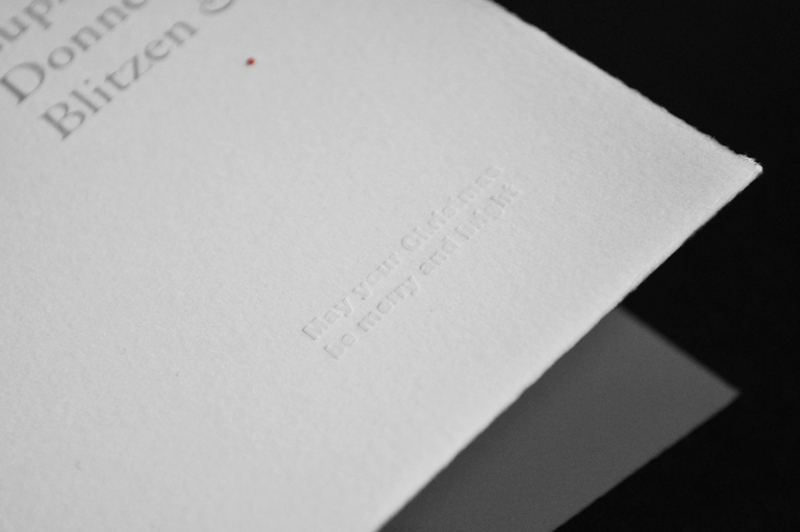 Hand set in 24pt Caslon, and printed in silver with a touch of red. May your Christmas be merry and bright, blind debossed in Monotype Grotesque 216. Finished off with a bit more Monotype Grotesque. And now December is upon us, our letterbox has been in use none-stop; we've never had so many Christmas cards. Not only are we feeling very popular with the postman, but each envelope brings a lovely surprise of a hand printed card, every one unique, every one making us feel more Christmassy. It's been great fun. And thanks for all the cards! Some lovely Christmas cards bringing festivity to our studio. And more keep turning up through the letterbox every day! Not only cards, but gift tags too! We've been spoilt.